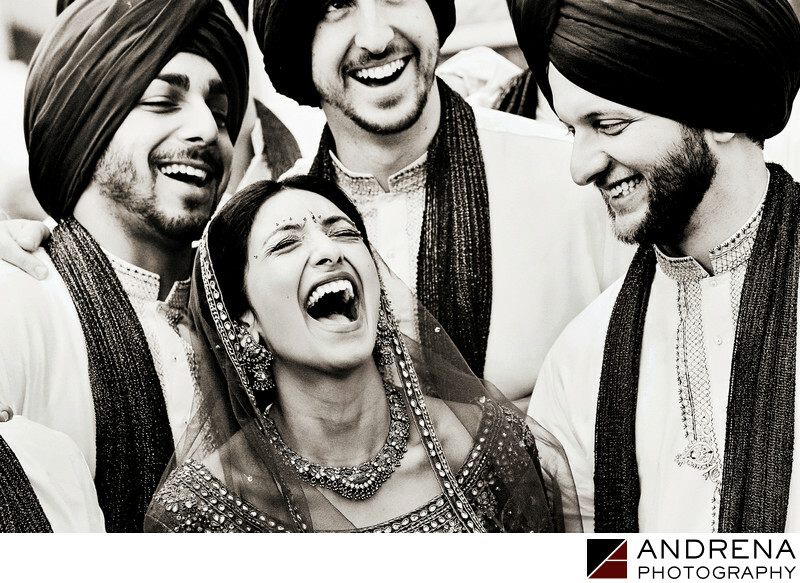 I love this photo of a Sikh bride laughing her head off. In fact, many clients who come to my studio mention this image as being one that they particularly love because it is such a great moment. But what they don't know is that I actually staged this moment. I didn't really have to do much. But the bride and the groomsmen were just standing around, so I asked the bride to burst out laughing. Thankfully, she threw her head back and broke into huge peals of laughter, which in turn made the groomsmen start laughing. Though the moment itself wasn't spontaneous, it remains a great example of how a little coaxing and direction can turn an ordinary moment into a memorable one. Indian wedding photographed at the Beverly Wilshire Hotel in Beverly Hills, California.